If you are looking for dramatic flowers, consider tropical hibiscus (Hibiscus rosa-sinensis). The trumpet-shaped flowers are 3 to 8 inches in diameter with dramatic protruding stamens. Flowers are produced constantly, but each blossom lasts only one day. These plants can grow as high as 15 feet in good garden locations. In colder climates are often planted as container specimens that are either replanted annually or brought indoors during the cold months. In warmer climates, tropical hibiscus is grown as a perennial garden plant and is used as a woody shrub for hedges and screens. In colder climates, it is often planted in large containers as a patio or deck specimen. Tropical hibiscus can grow as high as 12 or 15 feet, but when brought indoors, it is usually trimmed back to 5 or 6 feet. 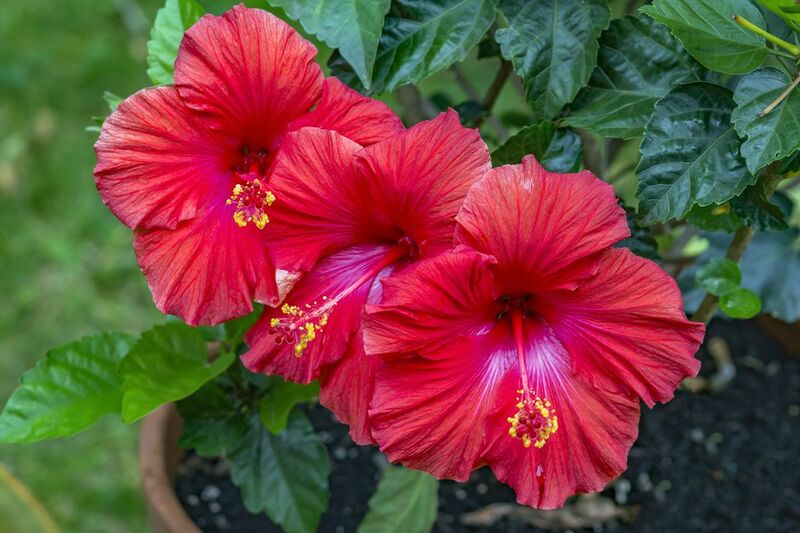 Tropical hibiscus is generally free of pests and diseases, but try to maintain consistent soil moisture and air temperature to help prevent yellow leaves. Spider mites and aphids are common insect pests. Plants can develop bacterial diseases due to transmission from insects, rain, and fog; symptoms are leaf wilt, dwarfing, stem rot, and distortion of leaves. While most plant tags will tell you that tropical hibiscus takes full sun to partial sun, in reality, if you live somewhere hot and bright, you should go more towards a partial sun location. In Northern climates, however, your hibiscus will probably be happier in full sun. If your outdoor plant is consistently producing hibiscus flowers, it is happy, so keep doing what you're doing. If your plant is not producing buds and flowers, try moving it into an area that has either more or less sunlight. For growing in a container, use a well-drained potting mix, preferably one noted for tropical plants. Outdoors, your soil should have lots of organic matter, and it helps to add a layer of compost. Tropical hibiscus is a thirsty plant and will only thrive and produce blossoms if it is given enough water. Depending on heat, wind, and humidity, your plant may need to be watered daily, or even twice a day in extremely dry conditions. It may need 1 to 2 inches of water per week. However, soils need to be well drained. If your hibiscus is dropping leaves, or you're seeing yellowing leaves at the top of the hibiscus, chances are it's not getting enough water. If your hibiscus has yellowing leaves in the middle or towards the bottom of the plant, chances are it's suffocating from too much water. The tropical hibiscus plant prefers a temperature between 55 degrees Fahrenheit and 70 degrees Fahrenheit. Heat over 85 degrees Fahrenheit can result in dropping buds and leaves. It can be killed by even a few nights below 50 degrees Fahrenheit, so move it inside if the temperature dips below 55 degrees Fahrenheit. If you live in a northern climate, it is possible to overwinter hibiscus indoors, if you can provide two to three hours of daily direct sunlight. Your plant will need less water in the winter, but the dry indoor heat of winter is hard on tropical plants, so you will need frequent shallow waterings. If you see any buds, remove them—you don't want your hibiscus to flower in the winter. In the spring, cut the plant back and put it back outside once the nighttime temperatures are consistently above 50 degrees Fahrenheit. When you buy a potted hibiscus, it likely has a slow release fertilizer mixed into the soil so it will not require much feeding in the first few months. After that, regular feeding with a diluted fish emulsion fertilizer will keep in blooming vigorously. For consistent flower production in container plantings, make sure to avoid very deep containers, which can cause the plant to spend its energy on root development at the expense of flowers. In mixed containers, the ideal pot shape is quite wide but relatively shallow. You will likely need to repot your plant every one to two years. Look for signs that it is dropping leaves, appearing stressed, or hasn't been growing well. You can propagate your tropical hibiscus from soft-stem cuttings taken in late spring. It is good to use rooting hormone, and be sure to keep the cuttings out of direct sunlight until they are growing. Hibiscus rosa-sinensis "Bonjour" constantly blooms with red and pink flowers. It grows 4 to 6 feet in height. Hibiscus sinensis "Magic Moment" has 10-inch flowers in hues of peach, orange, pink, and light purple, on plants growing up to 8 feet tall. Hibiscus rosa-sinensis "Cajun Cocktail" has lovely variegated blooms 6 inches wide, with no two blooms exactly alike. The best time for pruning tropical hibiscus is in the fall for garden and container plants. Pruning will help keep your tropical hibiscus flowering as flowers form on the new growth that is stimulated by pruning. Removing some branches if the shrub is crowded can let in more light. Alway removed branches that have died, been broken, or appear diseased. How to grow beautiful and tasty strawberries in pots.